SANTA MONICA, CA -- (MARKET WIRE) -- March 20, 2007 -- Since 1996 WestsideRentals.com has successfully connected hundreds of thousands of quality tenants with landlords and roommates. WestsideRentals.com is the definitive location for owners and managers of Los Angeles rentals to locate quality tenants searching for apartments in Los Angeles, condos in Los Angeles, houses for rent in Los Angeles, and guest houses for rent in Los Angeles. Initially started in Santa Monica, due to overwhelming demand from landlords in need of quality tenants to fill their vacancies, WestsideRentals.com has grown to cover most of Southern California. As a service to the rental community we regularly publish rent surveys to assist in making the rental market more transparent and efficient for all of its participants. For February 2007, the average listed rent price of all listed rentals in these areas was $2,411.35, representing a 1.1% decrease in rent prices over two months ago. This was a general price decrease across all rental types, with about 16% of listings in the West Los Angeles -- North region being houses, duplexes, or triplexes, as opposed to apartments, condos, or townhouses. This ratio of houses to apartments was relatively unchanged over two months ago, when approximately 15% of listings in these areas were listed as houses, etc. There was a shift toward more multi-bedroom houses and apartments listed for rent. Two months ago, approximately 49% of listings in the West Los Angeles -- North region had two or more bedrooms. For February 2007, that percentage has increased to approximately 53%. The largest rent decreases occurred in Bel Air, where the total decrease was 16.5% and Santa Monica, where the total decrease was 3.2%. 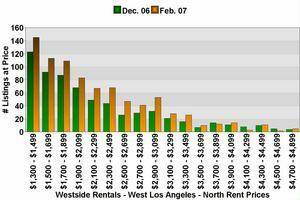 Rent prices also decreased in Brentwood (down 2.1%), Westwood (down 2.0%), and Century City (down 0.9%). Rent prices increased in Beverly Hills by 16.0% and West LA by 7.8%. Rent prices were also up in Beverlywood (up 5.6%). This data is based on the listings at WestsideRentals.com, which are based entirely on the information provided by landlords who choose to list their vacancies on the service. WestsideRentals.com believes that the search for housing is a very personalized process. The best way for an individual to get educated on current market trends is to see the market in action. Register today to receive Free Listings in your email.